Shadow Mountain Community Church offers shuttle bus rides to and from the church every Sunday. Use of the shuttle buses allows attenders to easily find a place to park and still be just steps away from the church. 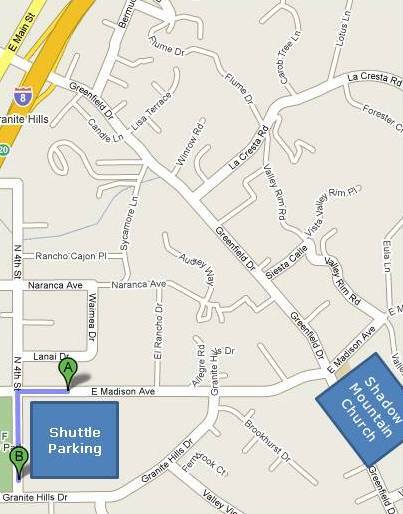 The shuttle bus parking lot is at Granite Hills High School [see map below]. The one way ride takes less than five minutes and you are delivered right to the church or your parking lot. The buses run continuously from 7:30 AM to 1:00 PM.